The state of Tennessee is located in the Southeastern region of America. Also known as “the Volunteer State”, it is famous for various things such as country music, smoky mountains and more. The state is home to a number of colleges and universities that are among the top-ranked academic institutes in the nation. Students who want to become nurses can find plenty of options in Tennessee. The nursing schools in the state offer programs for both the traditional and non-traditional students. Students can pursue undergraduate as well as graduate-level programs in a wide array of nursing concentrations. The exceptional staff, up-to-the-minute learning methodologies and the practical experience makes obtaining a nursing education in Tennessee a great idea. Nursing students can spend one year studying to become a LPN (licensed professional nurse). They can also pursue a two-year associate degree or a 4-year bachelor's degree that can help them attain the title of a Registered Nurse (RN). The Ph.D. programs are also available in this field. Students can choose from concentrations such as ethical nursing behaviors, nursing administration, nursing education, patient-care technologies and nursing informatics. Other areas of study include pharmacology, pathological physiology, mental health nursing concepts and leadership and decision-making. In addition to traditional programs, students can pursue online degrees or certificates that help them study from the comfort of their homes. As job opportunities for nurses are plentiful, entering into this profession can help students find jobs in various settings. Nurses can work in clinics, labs, hospitals, nursing homes, offices of physicians and outpatient departments. Compensation depends on their qualification, job location and experience. 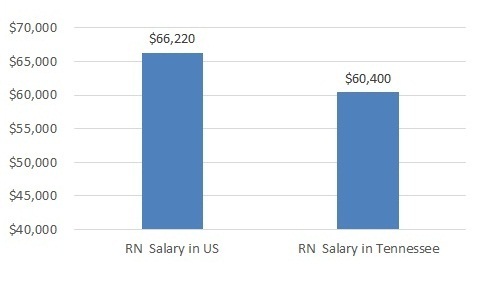 Nurses' salaries range between $44,000 and $95,000 on an annual basis. As there are various nursing schools in Tennessee, students should explore all their options to pick a program that best suits their needs. They should determine the type of degree or certificate they want to earn. It is important to enroll in accredited programs as they can help students find the best jobs in the marketplace. Students should compare various institutes in terms of the programs they offer, location, fee structure, and financial aid. How much do nurses make in Tennessee? Registered nurses in Tennessee in 2013 earned a median annual salary of $56,100 or $26.96 per hour. RNs nationally earned a median annual income of $66.220 or $31.84 per hour, in 2013. Q:Which factors do I need to keep in mind while selecting among the different nursing schools Tennessee? A:There are a number of factors that you should consider, while deciding among the different nursing schools Tennessee. Make sure that the school you choose is accredited and offers you a degree according to your preferred career. Check the location of the school and see if the school offers some online courses. Also check the school's passing rate for NCLEX exam. Find out if the school has the rotational programs for nurses, as they help in developing various nursing skills. Q:What will I learn from the nursing schools in Tennessee BSN? A:Nursing schools in Tennessee BSN will help you learn the science and principles of nursing. The Bachelor of Science in Nursing is specially designed to equip nurses with knowledge and skills required in the professional roles away from bedside. The coursework is based on nursing, science, research, leadership, and nursing informatics. Nurses also receive education in math, humanities, and social sciences during the program. This program also opens up opportunities for career advancement and better pay. Q:What are the prerequisites I need to complete to qualify for the top nursing schools in Tennessee? A:The admission requirements of nursing schools in Tennessee will vary from school to school. However, completing the nursing prerequisites is necessary. These typically include courses such as anatomy, physiology, biochemistry, and general sciences. Take a look at our page to learn more about nursing program requirements and the nursing prerequisites. Q:What kind of nursing programs do the best nursing schools in Tennessee offer? A:Nursing schools in Tennessee offer a variety of nursing programs. Students can choose to become a Licensed Professional Nurse (LPN) by pursuing a one year program. They also have a choice of pursuing a two-year associate degree or a 4-year bachelor's degree that can enable them to become a Registered Nurse (RN). Many nursing schools also offer PhD programs in nursing. Q:Can you tell me how to select a nursing school in Tennessee? A:In order to find a suitable nursing school in Tennessee, you will need to keep certain factors in mind. Important factors to select a nursing school include accreditation, degree programs, curriculum, concentration, qualification of faculty, and location. You may look for accredited online schools as well, to acquire quality education in a flexible manner. Q:Is it possible for me to enroll in the best Nursing Schools in TN? A:There are many popular nursing schools in TN that offer nursing degree programs such as the following: LPN degrees, RN degrees, BSN degrees, and MSN degrees. You must fulfill the basic admission requirements to enroll in any program. It is important that you have completed the basic nursing prerequisites. Other requirements may include letters of recommendation, a high school diploma, and more.